HONOLULU (HawaiiNewsNow) - When Nick Rolovich returned to Manoa last winter as the University of Hawaii head football coach, he found a team that needed a major morale boost. Fast forward through a seven-win first season that included the program's first bowl victory in a decade, and the team is in a much better spot heading into Rolo's second spring camp. "There's a lot more ownership right now by our team than there was last year," said Rolovich. "We used to have to poke them a little bit and make sure they're doing everything right. They're holding themselves accountable at another level which is good to see." Tabbed as winter ball just as much as it is spring ball, the reason for the early start is to give players more time to focus on finals later in the semester, as well as to build off of the momentum of last season. 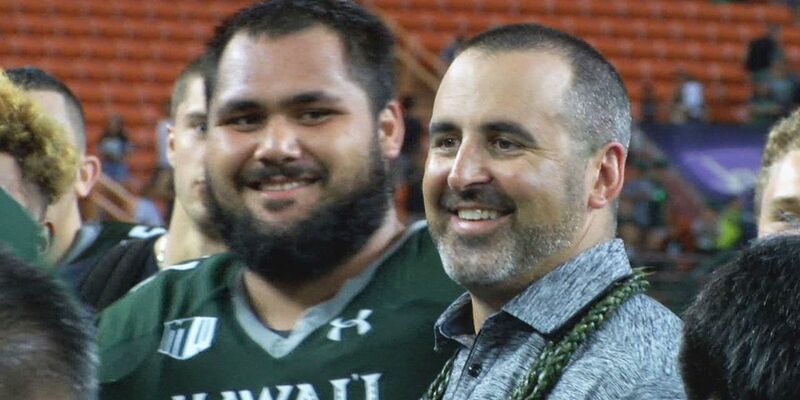 Asked what he took away from his first spring camp in charge of the Rainbow Warriors, Rolovich said the level of support there is for the program. "The attendance of the football alumni and what an impression that made on our guys to let them know how many people care about them. All the fans that came out, it's completely open to anybody that wants to come. There's a lot of great football fans on the island. Whether they study X's and O's, whether they like the dynamics of the team, we just want to bring them into the family as much as we can."